According to different customs in different churches, the name for the weekly liturgy varies. Names include Holy Communion, the Eucharist, the Lord’s Supper, or the Mass. Whatever we call it, the purpose is the same, to offer a sacrifice of praise and thanksgiving to God, to remember Christ’s death that we might have life, and to renew our covenant bond with our Father by receiving His Son with bread and wine. Christians have different views on the Eucharist and conduct it in different ways, but virtually all agree that it is commanded by our Lord and is important for the fullness of Christian life and discipleship. For over two thousand years Christians have gathered weekly to listen to the words of Jesus and of the apostles and prophets of Biblical days, to remember Christ’s death and resurrection, and to be nourished by His divine life in bread and wine. When you first arrive at All Saints or St. Katherine's, you will enter the NARTHEX, which is simply the foyer or lobby of the church. Here you will be greeted and given a prayer book, a hymn book and a copy of our pew sheet, which includes the readings for the day as well as news of upcoming events in our church family. 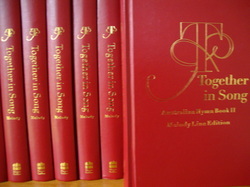 A limited number of large print hymn books are available upon request. As you pass from the Narthex into the main body of the church you come into the main seating area, sometimes called the NAVE from the Latin word for “ship.” In Christian art, the Church is sometimes pictured as a ship sailing for the kingdom of God. The passengers of the ship are the parishioners sitting in the main part of the church. From your seat, you can see the other parts of the church. At the front is the CHANCEL. It's from here that the liturgy will be led. Beyond the chancel is the sanctuary where the altar is situated. There are several things to notice; just to one side of the chancel is a LECTERN (from the Latin “to read”). The Bible readings appointed for the week are read from here. At St. Katherine's, the sermon is also preached from the lectern. At All Saints the sermon is preached from the PULPIT located on the opposite side of the chancel. In the centre of the sanctuary is the ALTAR. The altar is where the bread and wine of the Eucharist are consecrated and administered. The altar occupies the holiest spot in the church. The church has itself been set apart from the world of human work, and the altar is elevated above everything else and is set apart from the rest of the church by the altar rail. You may sit anywhere you like in the nave. A good thing to do when you are seated is to prepare your heart and mind for what is about to happen by quietly praying or simply being still both outwardly and inwardly. The word LITURGY means “work of the people,” which means that all of us are players in the great drama that is about to unfold. The Eucharist (from the Greek for “thanksgiving”) is a communal act: we are not only in communion with God, but also with each other. Bishops, priests, deacons, and appointed laity will lead the service, but all of us are offering worship to God. The members of the congregation are not passive observers, but active worshippers. The only person in the audience at our act of worship is God. If a priest occupies a special place in the Liturgy, it is only because they represent the role of Jesus in the Lord’s Supper, which is a re-enactment of the Last Supper presided over by Jesus. It is the Lord’s Supper because He is the host, and very much present when we gather in His name. The priest at All Saints with St. Katherine's normally wears a white garment called an ALB (from the Latin for “white”). Sometimes instead of an alb, he will wear a black cassock. When a cassock is worn, a white surplice or cotta is worn over it. Anyone participating in the liturgy may wear an alb or cassock. 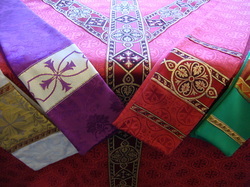 Priests and deacons, however, will also wear a stole as a sign of their ordination. The stole is a long piece of fabric matching the colour of the season (white, green, red, or purple - see picture right) and is usually decorated with symbols of spiritual significance. Deacons wear their stole over the left shoulder and tied on the right side. Priests and bishops wear it over both shoulders. The priest who is leading the service is called the celebrant and they will also wear a chasuble (from the Latin for “little house”). The chasuble is worn over the other vestments. It is oval in shape, sleeveless, and has an opening for the head in the centre. The priest wears a chasuble for the entire liturgy during Eucharist services. The Liturgy begins with a parade! As we begin to sing our first hymn, the priests, choir, and others who will assist in leading the service enter the nave from the narthex. 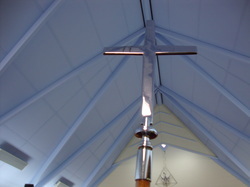 You will see at All Saints Church that leading them is the CRUCIFER carrying the cross, an important symbol to Christians. The procession is the sign that we are about to enter a heavenly world of worship. At the conclusion of the procession and singing of the first hymn the Christian greeting is given with the words "The Lord be with you" to which the congregation respond "and also with you" The weekly notices are usually read before prayer as we prepare ourselves to receive God's Word and Grace. Our prayers continue with a prayer of confession. This is where, in the silence of our hearts, we acknowledge the ways we have closed ourselves off from God’s life in us. Then, in response to our collective prayer, the celebrant, in the name of Christ speaks words of absolution. This is a pronouncement of God’s forgiveness based on God’s promise. At St. Katherine's Church Confession & Absolution take place later, in ACT 2. The next act in this great unfolding drama is the Liturgy of the Word. Here we listen to readings from Scripture. We then hear a sermon after which we confess our faith by reciting the Nicene Creed, and respond to God in prayer. The readings at All Saints with St. Katherine's follow a lectionary, which is a schedule of readings that balances two aims. One aim of the lectionary is to help the church systematically read most of the Bible every three years. A second aim is that the weekly readings would reflect themes related to the particular time in the Church year. The lectionary provides for four readings (or lessons) each Sunday: an Old Testament lesson, a Psalm, an Epistle from the New Testament , and a reading from one of the Gospels. The gospel reading is handled differently than the other readings. Whereas members of the parish read the first and second readings, the gospel is read by a deacon in accordance with ancient tradition. However, in the absence of a deacon the gospel is always read by the priest. A further difference is that whilst we sit for the other readings, we always stand for the gospel. Traditionally, whilst the other readings are not accompanied by any special acts of devotion, the reading of the gospel is often accompanied by making the sign of the cross. When the reading is announced, you may, if you feel moved to, make a full sign of the cross (touching your forehead, your heart, your right shoulder, your left shoulder, and then bringing your hand back to your heart) or you can make three small crosses using your thumb over your forehead, lips, and heart to indicate your openness to the gospel to touch your thinking, your speaking, and your heart. 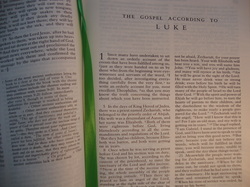 The sermon is usually based on one of the readings, particularly the gospel, but could be based on another text or topic at the discretion of the preacher. After the sermon, there is some reflective silence during which you can quietly pray in response to the proclamation of God’s word. This is where we declare our common faith, not only with each other, but with the universal Church. At All Saints with St. Katherine's we use the Nicene Creed (see below) which serves as a wonderful outline of our faith. It tells God’s story and summarises the important things God has revealed to us about the Divine Persons, Father, Son and Holy Spirit and about God’s work in the world, primarily through the Son, Jesus Christ our Lord. The Liturgy continues with prayer led by the priest or Lay Reader. We pray for the Church, for the world, for the local community, for other Christians and people of faith, for the needs of the sick and troubled, for those who need to come to the light of faith, and for those who have gone before us in faith. Our prayers at St. Katherine's Church continue with the Preparation of the Lord's Supper that includes a prayer of confession. This is where we acknowledge the ways we have closed ourselves off from God’s life in us. Then, in response to our prayer, the celebrant, in the name of Christ speaks words of absolution. This is a pronouncement of God’s forgiveness based on God’s promise. At All Saints Church, you might recall from reading above, confession and absolution will have already taken place in ACT 1. The Peace is a feature on at All Saints Church. Assured of God’s forgiveness, we now greet one another with ancient words, “The peace of the Lord be with you.” We are at peace with God and with one another. As a sign of that peace we offer the peace of the Lord to one another with the words like "Peace be with you" along with an handshake, embrace or kiss, depending on how well you know people. It's important to make the this moment distinct from those times when we greet each other - we are not saying "Hello" "How are you?" or "You are very welcome". Nor do we use this time as an opportunity to talk about what we've been doing in the week. 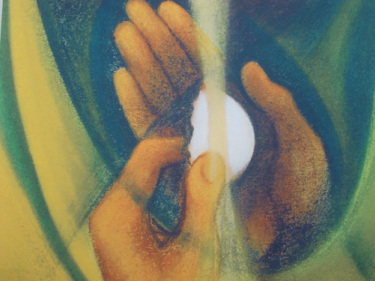 It is a time to share the Peace of Christ - "Peace be with you"
With Act 3 our focus shifts from Word to Sacrament, from the pulpit to the altar, from Christ’s words to us, to Christ’s sacramental presence in our midst. The liturgy of the sacrament begins with bringing our offerings to the Lord. Three offerings are included. First, there is an offering of bread and wine offered by members who volunteer to do this. Second, there is an offering for the poor. At All Saints church this takes the form of food for the Food For All Organisation who distribute food to the needy of our parish and beyond. A basket for donations is in the narthex and is brought forward to the altar at this time in the service and offered to our Lord of the poor. Thirdly, there is a financial offering where we bring our tithes and offerings for the work of Christ’s Church. “Eucharist” is from the Greek “to bless” or “give thanks.” At Jesus’ last supper with his friends, our Lord gave thanks at the start of the meal by saying a prayer of blessing over the bread. After the supper, he gave thanks for the wine. These prayers of thanksgiving had their roots in traditional Jewish table prayers. What made the last supper unique was that not only did Jesus give thanks for bread and wine, but he identified himself with the elements, saying, “This is my Body. This is my Blood.” He also commanded that that his followers continued to replicate this friendship meal. First, there is the Sursum Corda (Latin for “lift up your hearts”). This part of the prayer is a call to lift our hearts to the Lord, to which the congregation responds, “We lift them to the Lord.” The Eucharist is the means by which the Church becomes what it already is, seated with Christ in heavenly places. Next the celebrant says, “Let us give thanks to the Lord our God,” to which we respond, “It is right to give our thanks and praise.” The name Eucharist comes from the Greek word to give thanks, and that is what we are about to do. The second part of the prayer, sometimes called the preface, is the fulfillment of what we have just been invited to do. This part of the prayer rehearses God’s acts of creation and redemption and thanks him for them. Next is the Sanctus hymn (Latin for “holy” and pronounced sank-toos). This is the song that Isaiah (Isaiah 61) and John (Revelation 5) heard sung around God’s throne. When we sing it, we participate with them, not sentimentally, but actually. That's why the Sanctus is usually introduced with the acknowledgement that we are singing with angels and archangels and all the company of heaven who have served our Lord in every age. They are with the Lord now, and in the Eucharist we are lifted up to participate in the worship of heaven. The prayer of consecration continues and includes an important moment when the celebrant repeats Jesus’ original words of institution: “This is my body. This is my blood.” Until now, the focus has been on our being lifted up to the Lord. But in these words we are struck with the mystery of the Incarnation, that Christ has come down to us, offering us his very life, his body and blood. The final part of the prayer includes something called the epiclesis (Greek for “invocation”) when the celebrant invokes the coming of the Holy Spirit upon the congregation and upon the offering of bread and wine. According to Jesus’ own words, it would be the Spirit who would make Christ known and actualize his presence in the Church and the world (John 14-16). All baptized believers in Christ (Anglican or otherwise) are welcome to receive Holy Communion. At All Saints with St. Katherine's we go forward and kneel or stand at the altar rail to receive communion. Someone will direct pew-by-pew for people to go ahead to receive the bread and wine. After you have knelt, or are stood in position, form a cup with your two hands to receive the bread, and then eat it in remembrance that Christ died for you. 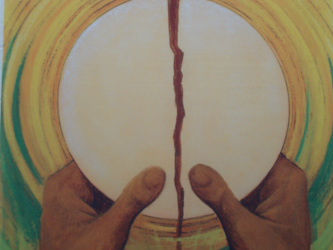 When the person with the chalice comes to you use your hand on the base of the chalice to guide the wine to your lips. Drink in thanksgiving that God is in covenant with you and that Christ gives his life to you. If you are not able take wine, you may simply touch the chalice. If you have not been baptized, you are welcome to come to the altar to receive a prayer of blessing. Simply cross your arms in front you, with your right hand on your left shoulder and your left hand on your right shoulder. This is a posture that lets us know you would like a prayer of blessing. After we have received Christ’s Body and Blood we give thanks to God with prayer and singing. We give Glory to God and worship his faithfulness. The celebrant then gives us God’s blessing after which we sing again as those who have led the service parade back down the aisle in the same way that they came in. They do not, however, completely leave the nave. They stop short of a complete exit because there is still one very important act in the great Eucharistic drama. We have celebrated the drama of God’s mighty acts by hearing his Word; we have received the Body and Blood of his Son under the forms of Bread and Wine; we have been taken to heaven in a liturgy shared with the communion of saints. "Go in peace to love and serve the Lord"